Women organizations protest against child marriage in front of the Press Club in Dhaka. 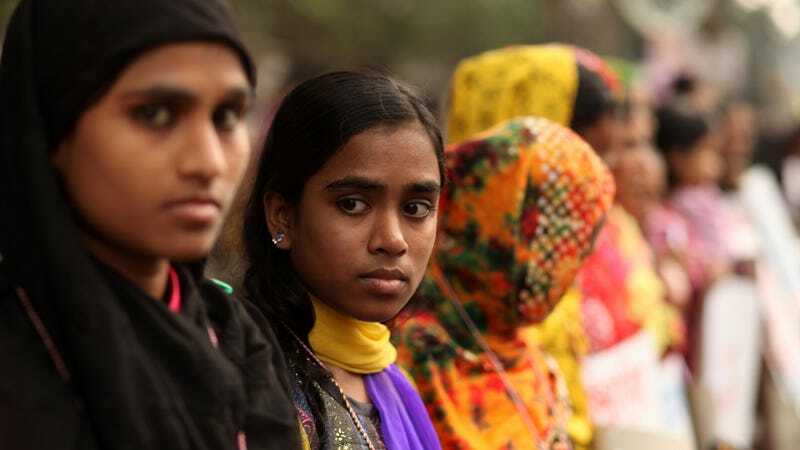 Child marriage is a big problem in Bangladesh; it now reaches 66 percent of those who marry before the age of 15 and leads to many kinds of health problems. In the midst of separate but simultaneously disturbing cultural conversations about both the United States’ immigration policies and the sexualization and victimization of underage girls by adult men, another startling report has emerged. The report, issued by the Committee on Homeland Security and Governmental Affairs and titled “How the U.S. Immigration System Encourages Child Marriages,” outlines the legality of this practice, because there are no minimum age requirements in the Immigration and Nationality Act. In fact, when weighing petitions—which can be filed by U.S. citizens or permanent residents—U.S. Citizenship and Immigration Services (USCIS) first base approval on whether the marriage is legal in the petitioner’s home country, and then consider whether the marriage will be legal in the state where the couple intends to live. This highlights the fact that many U.S. states have lax regulations on the marriage of minors. For instance, in New Hampshire, a child as young as 13 may marry with parental and court approval. And, as is permitted in New Hampshire and Rhode Island, in 2013, the World Policy Analysis Center found that of the 93 countries allowing marriage prior to age 18 with parental consent, 54 of those countries allow girls to marry one to three years younger than their male peers. And understandably, the government’s findings are raising long-overdue concerns about how our current immigration policies are enabling forced marriage between minors and adults—and how our laws may be exploited to procure U.S. passports. An interview with one former child bride affirms this. Naila Amin is a dual citizen from Pakistan who was raised in New York City before being forced to marry in her parents’ native country at age 13. She was then compelled to petition for her 26-year-old husband to join her in America. Even more disturbing is that Amin was only eight years old when she was promised to her then 21-year-old cousin. Apparently not, despite a two-step process which requires both considerations by USCIS and approval by the State Department before visas and green cards are granted. Citing the 3.5 million petitions received by USCIS between its 2007 to 2017 fiscal years, the government’s report reveals the following data: 5,556 approvals were petitioners seeking immigration for minor spouses or fiancees, while 2,926 were minors requesting entry for older spouses. In 204 cases approved during that same period, minors petitioned for other minors. Separate data reveals that during the same 10-year period, 4,749 minor spouses or fiancees were given green cards. And while Mexico generated the most petitions and Middle Eastern nationals have the highest percentage of approved petitions, this isn’t an issue that will be solved by a wall. New Jersey native Fraidy Reiss was an Orthodox Jewish 19-year-old and technically legal to marry when her family forced her into an abusive marriage. Today, she campaigns against forced marriages as the head of Unchained at Last. According to the AP, her research determined that nearly 4,000 minors, mostly girls, were married in New Jersey from 1995 to 2012, including 178 girls under 15. So, with this report generated, what now? USCIS says it has resolved some of its data collection issues and implemented a “flagging system” that requires verification of the birthdates of minors—but to what end? As far as USCIS is concerned, that’s yet another problem for Congress to solve, disheartening news to receive during a governmental shutdown.